Article Update on August 2017 incident. Washington, D.C. Last month, five workers at 4825 Glenbrook Road (part of the Spring Valley project where the prior American University Experiment Station was located) were potentially exposed to an unknown chemical. The site crews are remediating WWI-era CWM at the site. Five of the seven workers exhibited symptoms of eye irritation and minor stomach issues. The workers were decontaminated onsite and reportedly all symptoms had subsided within an hour of the potential exposure. However, as a precaution, the workers were sent to George Washington University Hospital for medical monitoring and observation. All of the workers were released for work later that evening and all reported to work the next day. The worksite where the possible exposure occurred was not shut down but has entered into a non-intrusive work pattern while a formal board of USACE, EPA and District of Environment and Energy (DOEE) officials investigates the incident. The board is expected to release a report at the end of October at which time a return to work phase will be announced. The USACE Baltimore District provides weekly updates on the ongoing project at http://www.nab.usace.army.mil/Home/Spring-Valley/. Oyen, Canada A UXO disposal operation conducted on Canadian Forces Base (CFB) Suffield is suspected of causing a wildfire which destroyed a farm including six structures and farm vehicles and equipment. The Base Commander told reporters that a disposal operation aboard the base sparked a wildfire which took a number of assets from both the base and off-base to control. At the same time firefighters were fighting the on-base fire, a grass fire started north of the base with caused an evacuation of a school and 40 area residents. Twenty fire engines, 10 water trucks and other assets from several jurisdictions were deployed to battle the blaze. The fire destroyed farm owned by an 89-year old farmer whose family has been farming the area for at least two generations. 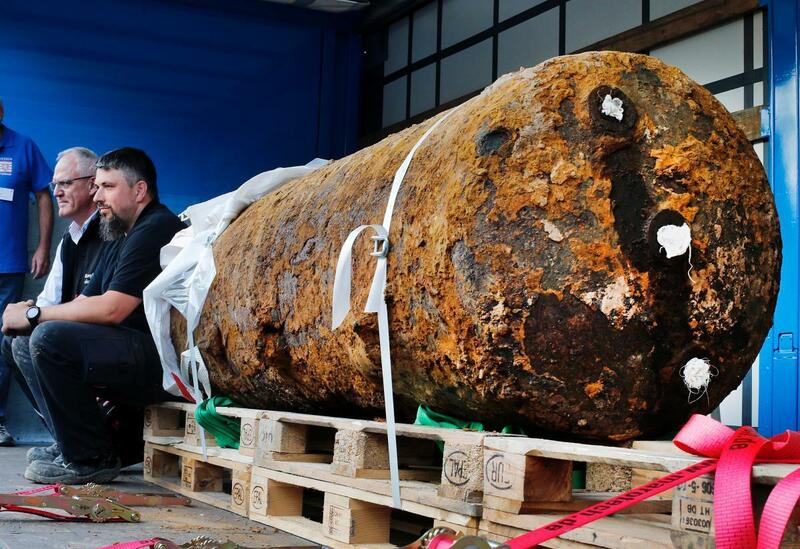 Frankfurt, Germany Construction workers uncovered 4,000 pound WWII era British bomb which sparked a massive response operation by police and bomb disposal personnel. The response involved evacuating nearly 60,000 residents and businesses from a 1 mile evacuation area. The bomb, identified as a High Capacity (HC) British Bomb (likely a MK I version given the reported descriptions), packed approximately 1.4 tons of high explosives). The render safe operation reported was completed ahead of the planned 12-hour response as bomb technicians safely de-fuzed the bomb so it could be transported for off-site disposal. Residents were allowed back into the exclusion zone following the response. 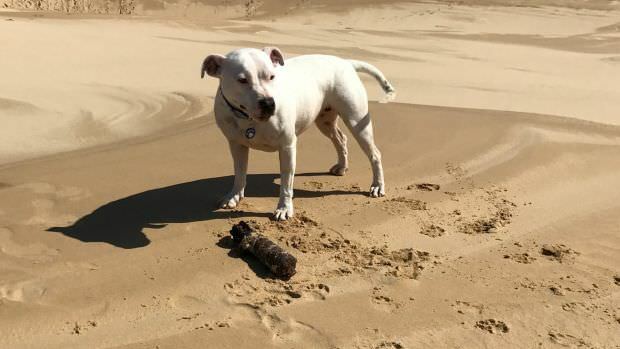 Port Stephens, Australia A family on holiday at Birubi Beach are lucky to be alive after their dog, Peppah - a female bull terrier, played fetch with an unexploded WWII era round. In an interview with a local newspaper, the family reported that Peppah kept bring over rusty metal parts for the family to throw in her favorite game of fetch. At first, the family though the item was an old rusty bike or car part, until the youngest daughter recognized it as a potential ordnance item. The family used a mapping program on their cell phones to pinpoint their location and called the police.